Sopela, a surfing paradise 20 minutes by metro from Bilbao. Sopela Surfing Town will show its surfing potential in Tokyo this week. Deus Ex Machina Harajuku will hold the promotional event this Friday , September 28th at 19:00PM. Leticia Canales and Omura Nao, Basque and Japanese profesional surfers will host the night. 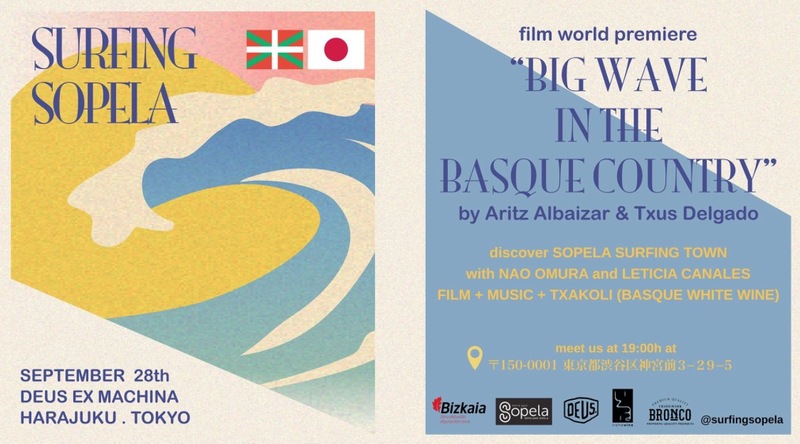 Guests will have the opportunity to enjoy the “BIG WAVE IN THE BASQUE COUNTRY” world film premiere ,by directors Aritz Albaizar and Txus Delgado. Incredible chance to discover the great surfing spots in Sopela. The party will go on with a Txakoli , Basque White Wine, tasting for all the guest. A new way to experience the Basque way of living. At Deus Ex Machina Harajuku Basement.